Occasionally the weather in Ohio will throw you a curve ball... that is exactly what is on the way for Sunday. Above I broke down a forecast model and keeping it as basic as possible. There are brown lines that indicate the states... I have most of Indiana, Ohio, Kentucky, and West Virginia in view. The areas of green are precipitation intensity. There are solid black lines that indicate air pressure, called isobars. In order to keep things simple, we will say that dashed lines are temperature. They actually are heights in the atmosphere, but let's just say they are temperature. So the dark blue dashed line is the freezing level. The light blue lines are areas cold enough (or shallow enough) to see snow and the red line is where it would be too warm (too deep) for snow and we would see rain instead. Right along that dashed dark blue line is the transition from rain to wintry mix to snow. That area will vary based on the surface temperatures and a whole lot of variables. 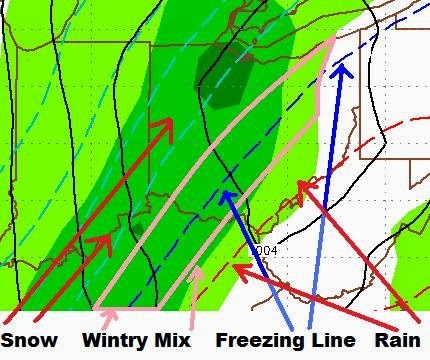 So as you can see in the above image, the wintry mix is right over Ohio. So the above images are from Sunday afternoon. 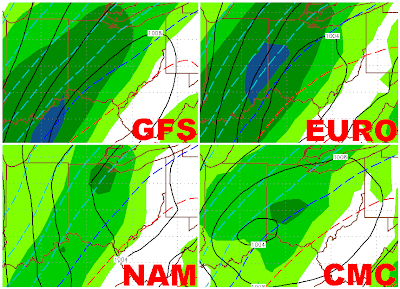 There are four models that I regularly use for my forecasts. The precip will start in Western Ohio in the morning Sunday and slowly push East into Central Ohio by midday and late afternoon for Eastern Ohio. As you can see all of the models vary as to where the freezing line will be. The location of the freezing line GREATLY alter snowfall totals. Keep in mind that one inch of rain is roughly equal to ten inches of snow. So any rain, sleet, or freezing rain for an hour or two could mean a few inches of snow IF it were cold enough. The warm air will push east by the evening and we will all fall below freezing Sunday night... just as the system is moving out of here. So for far Northwestern Ohio, by Lima, Toledo, Findlay... it is looking like all snow for you with 5-8+" of snow. For areas from Dayton to Marion to Akron... you will likely get into a little of the wintry mix and your snowfall totals will be less. For Cincinnati to Columbus to East Liverpool... a little rain to wintry mix, then MAYBE some lingering snow left over, but not nearly as much as NW Ohio. For SE Ohio, Chillicothe to Zanesville... you will see rain showers to wintry mix in the early evening, then very little snow, by comparison, by the late evening. Again, this info will likely change some as we get closer, but the GFS has been running the coldest and it is slowly warming up and agreeing with the Euro, NAM, and CMC. It is a very tricky forecast and the only places I feel confident, 48 hours out, giving a snowfall total forecast for... is areas that will see all snow, which is NW Ohio. The rest of us will likely see some rain or wintry mix that will greatly cut down on our snowfall totals. One thing I can guarantee is that next Monday night into Tuesday is going to be VERY, VERY COLD for Ohio. Likely breaking the record. Factor in the winds and we will see wind chills around -30°F in Central Ohio. The air temperature Tuesday morning will likely be around -10°F and we will struggle on Tuesday to get above 0°F for the high. Make sure to fill up your anti-freeze in your cars! I will keep an eye on things as it gets closer and have another update with more detail. Have a good one! BTW, this is my 999 entry... next one is 1,000th entry!!! !